In order to grow in the Netherlands, Rituals had to shift from being a gift for ‘someone’ to being a daily gift for yourself. We came on board to help them explore what that meant for the stories behind their collections. Happiness can be found in the smallest of things. Taking inspiration from age-old Asian wisdom, Rituals could help people discover the little miracles in everyday routines. 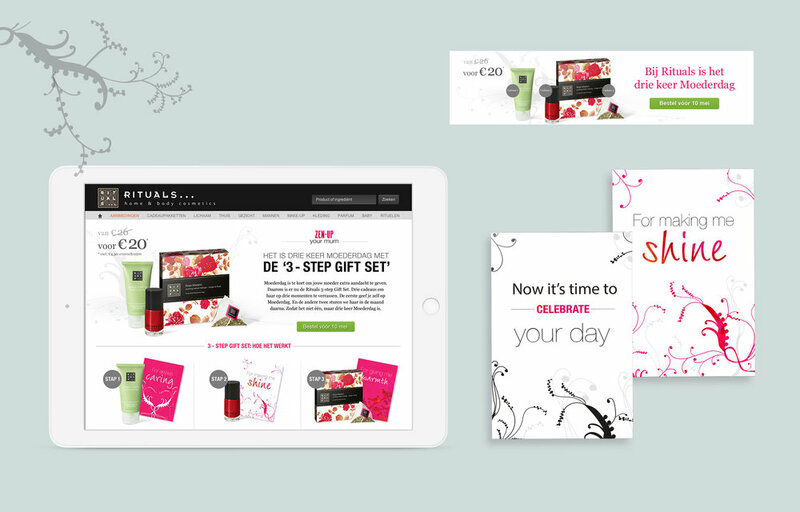 We developed the brand statement 'Enjoy life's little miracles’ and rolled it out through all communication platforms. Our aim was simple: to make each day that bit more special with Rituals. In order to inspire people, we crafted a brand story and developed uplifting concepts for campaigns and viral promotions. Plus, we created dozens of content pages for online use. How do you create inspirational content for the male care products from Rituals: Ancient Samurai? The launch was taking place in ‘Movember’, so we created content and design around the theme ‘Groomed to perfection’. Do you long to relive your summer holiday? For the summer campaign, we created several viral executions designed to help people hold on to that summer feeling. Your mother deserves your attention every day—not just once a year on Mother’s Day. We came up with the 3 Step Gift: one gift on Mother’s Day, and two more gifts which are sent to her at other moments in time. Each gift with a personal note attached.